When a person is angry or severely irritated, you may notice that the veins in their neck are protruding. These veins are called jugular veins, and they measure circulatory pressure. Distended neck veins occur when there are issues concerning the heart and lungs. The more severe the condition, the higher the veins extend from the neck. In this article, we will look at the symptoms and causes of this condition. We see these veins as they lay close to the surface of the skin. Jugular veins transport deoxygenated blood to the heart from the head. Distended neck veins are evident with the positioning of the body as well as a heightened pressure of the venous system. If the veins protrude when the head is at a 45-degree angle, you may have a form of cardiovascular disease. Let’s look at other conditions that can cause distended neck veins. These are some other causes of distended neck veins. This lump of the throat is an enlarged thyroid gland that protrudes as it compresses onto the jugular veins. The veins become distended when the superior vena cava has a blockage due to thyroid or breast cancer, or from a lung tumor. This condition causes compression on the heart chambers, forcing a decrease in their functioning. It can happen with the gathering of pericardial fluid. We have a valve between the right atrium and the right ventricle that prevents blood from back flowing into the right atrium. A malfunction of the valve causes tricuspid regurgitation and distended neck veins. Distended neck veins are one of many symptoms of COPD, along with shortness of breath, coughing, thick sputum, cyanosis, and wheezing. Known as a heart attack, blood and fluid levels in the veins increase when the heart malfunctions. Distended neck veins can lead to an array of mild to major complications, especially if heart failure is the cause. Heart failure may require surgery for an artificial pump or heart transplant, if not a death sentence. Any issues with blood pressure can result in cognitive problems, extreme fatigue, liver problems, and kidney issues. For a proper diagnosis, your doctor may have you position your head at a 45-degree angle to check for distention of more than three centimeters above the sternal angle. Physical examination of the neck entails checking the veins from one side to the another and not face-on. While the untrained eye may not be able to obtain the pulse of the jugular vein, a cardiologist uses specific tools for this measurement. These tools will help determine the pressure of the venous system and the state of the heart’s health. 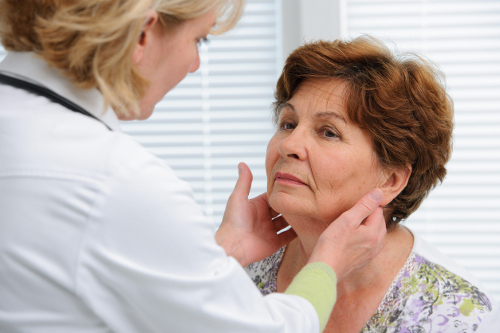 Doctors will recommend treatment depending on the underlying cause of the distended neck veins. Heart failure is immediately attended to with beta-blockers, and possibly diuretics and an ACE inhibitor. A change in diet and lifestyle activities may also be required to prevent further complications, including another heart episode. Distended neck veins can be a serious precursor to a life-threatening condition or may be a visible indicator of someone becoming irate. The bulging veins in the neck show an increase of pressure within the heart. Factors attributed to the high pressure can be the result of an underlying health condition or infection. Distended neck veins often accompany other symptoms such as chest pressure, excessive sweating, and an increased heart rate. Treatment is dependent on the condition, or ailment, causing the distention. Salina, “What Causes Jugular Vein Distention? Symptoms & How To Check It?” Simple Remedies, March 11, 2013; http://www.simple-remedies.com/health-questions/jugular-vein-distention-symptoms.html, last accessed July 7, 2017. “What Causes Jugular Vein Distention?” Health Grades, October 10, 2016; https://www.healthgrades.com/symptoms/jugular-vein-distention–causes, last accessed July 7, 2017.